I am returning to column-writing after several months’ hiatus, coincidentally, on one of the last subjects I signed off on: The Chibok girls’ saga. Yes, yesterday marked the fifth anniversary of that pathetic incident. There were solidarity rallies. Demands were made, government must bring back our girls; government expressed its regrets, and detailed efforts it had made over time to free the captives, promising not to surrender until the girls are returned, safe and sound. Five years on, the tears haven’t stopped flowing. The families, relatives and friends of the families of the victims haven’t stopped weeping and are inconsolable. It’s understandable. It is only when the girls reunite with their families that we can stop the tears, stop the aches in the hearts and the worries on the faces of concerned citizens here and abroad. It is only then that we can pat the government on the back for a job successfully executed, and the efforts can be called meaningful. Before going further, I should first have offered my profound apologies to readers and friends of this column, THE FLIPSIDE, for the ‘sudden break in transmission,’ as the men behind the microphone, in the electronic media, would have put it. Why did I temporarily stop writing? The challenge of running a business in a depressed economy, where all indices work against businesses, was one critical factor. The last four years, as many know, has been quite hellish for businesses in the country. In a dollarized economy, largely import-dependent, a weak, always fawning and falling national currency, the last three years in particular was killing! Those who run media houses or sit atop the organisations as managing directors, editors-in-chief or chief executive officers would easily understand what I am talking about; and when it is one of the largest-circulating newspapers in the country, operating three large printing plants in three major regions of the country, it is certainly a huge challenge! The second, not unrelated reason: Things happening in our country were depressing enough to make many people, including this writer, throw up their hands and mute their voices, albeit temporarily. One felt one had said and written everything to be said and written about the Nigerian situation and condition. What’s there to say or write again? The hardship? The hopelessness? The graft and larceny? The haughtiness and devil-may-care attitude of the political elite? These have been one’s writing interventions over the years. In one simple, short, sentence: I was losing faith in my country. Losing faith in its ability to restore hope to the hopeless, provide food for the hungry, shelter for the homeless, health for the sick, and jobs for the army of the unemployed. I simply plunged myself into running the business and catering for the immediate needs of the staff under my charge. Column-writing, the privilege to pontificate, intervene and proffer solutions to a wide range of national and public issues, was not a priority or preoccupation in the interregnum. So, what changed to make me make a return? Nothing! Simply the ‘rude’ awakening that we can’t all give up on our country, no matter how terrible we feel things have been over the years. We must continue to play our parts. We must continue to offer our modest contributions in whatever callings we find ourselves. A writer shouldn’t surrender to the shenanigans of the few guys in the corridors of the power strata at whatever level, messing things up for the generality. To surrender is to die inside as individuals, and kill our country in the process! I was also, in no small measure, encouraged on a rebound to ‘columnism’ (as Prof. Olatunji Dare would have put it) by the death of the young, vibrant and brilliant Canada-based Nigerian professor, Pius Adesanmi, who died in the ill-fated Ethiopian plane crash. Like me, he was saddened by how things had degenerated in his country. But, he never gave up, until he gave up [the ghost] in the air crash. For him, Nigeria was not irredeemable. He challenged citizens to challenge the status quo of rot and mediocrity by not settling for less than the acceptable global best practices and services. Now, I believe more than ever before that, to be good Nigerians, we must stand up for Nigeria. That should be the new song, the new mantra. That’s the way to go, even as the nation grapples with issues that confront and confound us all: the killings, the kidnappings, the acrimony and bitterness, the divisions, the hate and the decay. We can’t afford to give up or keep silent. That’s not patriotism or love for the country. Patriotism means loving your country with all your heart, that you are neither afraid nor silenced to tell truth to power. Yes, there’s hunger, there’s disillusion, there’s despair, there’s frustration. But we can’t give up; surrendering shouldn’t be an option. “Never, never, never give up,” says Winston Churchill, in any circumstance. So, here we go. I am standing for my country by telling the powers-that-be that Nigerians are sad that, five years after, we still haven’t rescued the Chibok girls from their captivity. 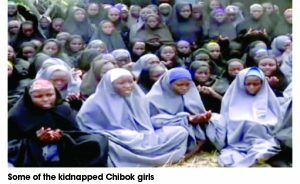 How the nation seems to have moved on, with 112 girls in the hands of their captors, remains baffling. Apart from a few voices here and there chanting and clamouring, the rest move on, seemingly unperturbed. What happened to our common humanity and fellow-feeling? Whatever it takes, ransom payments, back channel negotiations, just whatever, the President Muhammadu Buhari government must bring back our girls. He should make that his number one priority. Surely, efforts could have been made, as no government would sleep comfortably with its young citizens in harms way with heartless abductors. But, truth is, it is only when the girls are back, hale and hearty, that can we fully appreciate and applaud whatever efforts are being made. Let’s stand up for Nigeria by collectively condemning the killings in the land. Too many Nigerians are dying daily in careless and unnecessary circumstances. For how long will these continue? Ethnic killings, farmers/herders clashes, cult-related killings, across North and South of the country are painful and pathetic. Something urgently must be done to stem the ugly tide. Yesterday’s SUNDAY VANGUARD captured the issue poignantly, when it reported that 144 Nigerians had been killed in nine days. It is that bad. We are not at war, yet human beings are being slaughtered in internecine fights that leave blood and human carcasses everywhere. When you add the kidnappings, robberies and other crimes, you know these are indeed dangerous and frightening times. But isn’t that the reason every nation has a government: Security of life and property, as well as the welfare of the citizenry? There is the need for a national emergency to be declared on insecurity in the country. The security architecture needs to be overhauled. Are the security chiefs tired? If they are not, how come there has been so much blood-letting under their watch? Should they not be shown the door marked ‘exit’ for their inability to stem the tide of crimes everywhere? How much longer can we continue to justify emoluments to security chiefs who cannot secure life and property? We must get serious. No Nigerian life deserves to be wasted in avoidable circumstances. President Buhari has the urgent task to stop the drift. I am sure he knows. What is left is to act more swiftly and decisively. May God bless our country! I must have written over four columns or more on Leah Sharibu, the young Dapchi girl captured by Boko Haram, just like the Chibok girls. Leah was the lone girl kept by her abductors, after the Buhari government successfully rescued the girls from a Dapchi girls’ school that were kidnapped. Leah, according to reports, was kept for refusing to change her faith. And she has remained ever since with her captors. As the world marks the fifth anniversary of the abduction of the Chibok girls, we also remember Leah. We demand of his abductors: Please, set Leah free. End the nightmare and anguish of Leah’s family and the nation’s. Set the captives free. There’s a time to end every insanity. God is not God of agony and pains and blood-letting.